The software supports MS Outlook 2000, 2003, 2007, 2010(32/64 bit), 2013 (32/64 bit), 2016 (32/64 bit) versions. PST to Exchange Migration software supports 2013, 2010, 2007, 2003, 2000 (32 & 64-bit) versions of Exchange. Outlook to Exchange Migration Tool is compatible with Windows 2000, 2003, 2008, XP, Vista, or Windows 7/8/8.1, 2008/2012 (32-bit & 64-bit) versions. With the help of PST to Exchange Migration tool, one can easily import PST files to Exchange 2016 and all the below versions. All PST files stored on the local machine are easily searchable. Therefore, if a user wants, he can also upload PST to Exchange Mailbox in batch. A user can add complete folder containing multiple PST files and migrate them directly into the Exchange mailbox by mapping the SAM account. The Import PST to Exchange tool is designed with such a high tech algorithm that it imports all the data items stored in a PST file to Exchange mailbox. For example, emails, calendars, notes, contacts, and journals are uploaded successfully to Exchange Mailboxes. Apart from all this, the software will preserve Meta properties of all the data even after migration. The tool provides a feature to search PST file within the network and export it to the local network. The PST to Exchange migration software will look for all the machines that are available on the network. A user just needs to enter the server domain credentials and choose the machine, all the Outlook PST files from that machine gets uploaded automatically. As a user search for the Outlook PST files on a particular network machine, the tool will display all the PST files in it. However, if a user wants, then he can import selective PST file to Exchange Server mailbox as well. One just needs to check or uncheck the PST files and the software will move only selective PST file into Exchange 2013 mailbox. 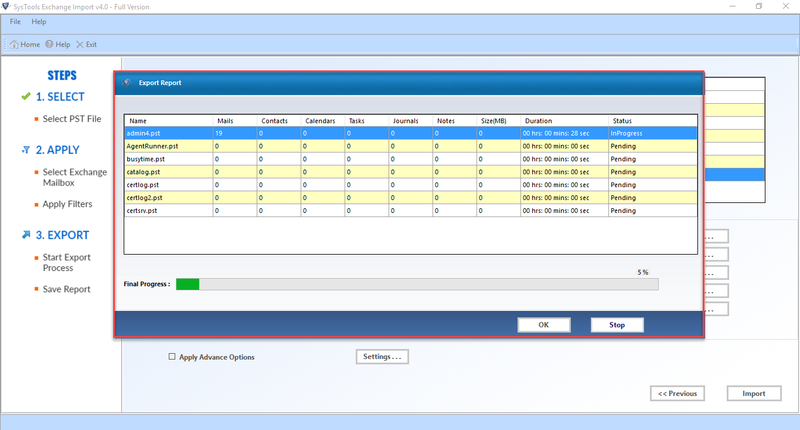 Another impressive feature of PST to Exchange Migration tool is its mapping feature. This allows users to upload PST file to specific Exchange Server mailbox. A user has to provide the name of SAM account i.e. nick name of the mail box. This will import PST file to respective mailbox of the Exchange Server directly without any confusion. After moving from Outlook to Exchange Server mailbox, the PST to Exchange migration tool will display a complete migration report. This will display the current status of a number of emails, calendars, journals, notes, etc., that are imported successfully. At last, a final report is generated containing complete conversion details. Demo version of PST to Exchange Migration Tool Only Import 50 Items/Folder from Selected PST Mailbox. 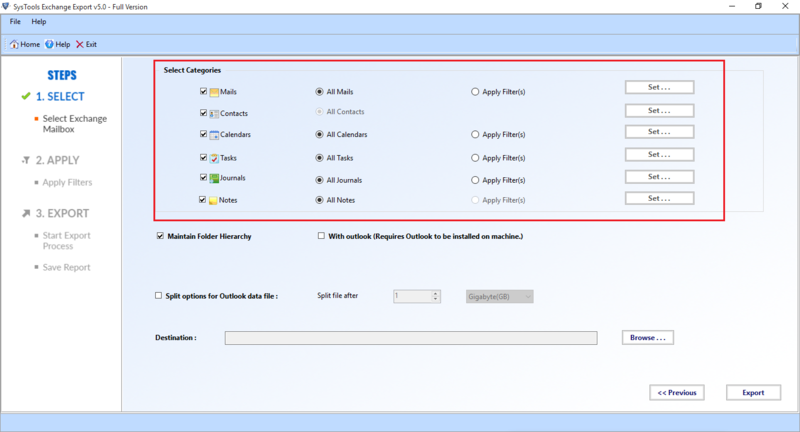 MS Outlook is required to be installed and configured for valid or dummy profile/account. Import data directly into Live Exchange Server 2003, 2007, 2010, 2013 Versions. There should be complete administrative rights for Exchange (2000-2003,2007-2013) Versions. MS Outlook – 2000, 2003, 2007, 2010(32/64 bit), 2013 (32/64 bit), 2016 (32/64 bit). Exchange Server – 2013, 2010, 2007, 2003, 2000 (32 & 64-bit). Explain the functioning of Exchange Import Tool? Step 1: Install & run the PST to Exchange Migration Tool. Step 2: Add the Outlook PST file/folder or search for local network for PST files. Step 3: After adding the PST file, add the nickname of the mailbox and then, click on Import button. Step 4: After that, the software will show the details of the data items migrated from PST files to Exchange Server. Step 5: A message of successful migration will be displayed. 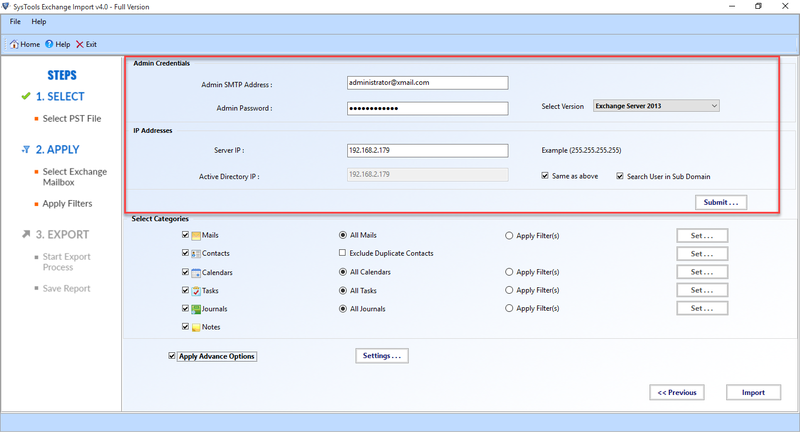 Step 6: Now, you can access your PST emails in Exchange Server. Is it possible to perform Exchange to Exchange migration using this tool? No, it is unable to perform Exchange to Exchange migration. This tool only migrates PST to Exchange Server mailboxes. Does the software require MS Outlook installation on the local machine to move PST to Exchange? Yes, MS Outlook installation is mandatory to install on the local system to import PST to EDB format via this tool. Does the software support ANSI type PST file? Yes, PST to Exchange Migration software is compatible with both ANSI & UNICODE type PST file and does not impose any file size limitation. Can I run PST to Exchange Migration tool on Windows 10 also? Yes, the software is compatible with all versions of MS Windows, including Windows 10. Can I import multiple PST files to Exchange 2013 at once? Yes, a user can add multiple PST file to the tool or can add complete folder also containing multiple PST file in it. Please ensure that migration machine and Exchange Server are under the same domain. "The PST to Exchange Migration tool is the ultimate application to migrate from Outlook to Exchange Server 2010. The user interface of the tool is so simple that it exports all data items of my PST files to Exchange 2013 mailboxes in just a few numbers of clicks. I liked this software so much that I am definitely going to suggest it to other users also." "I was looking for the utility that allows me to upload PST files to specific Exchange Mailboxes. While doing some work on the internet, I came to know about this tool. I must say that it is a perfect software to map & move PST file to desired Exchange Mailbox. Great work development team." "It was a difficult task for me to directly transfer Outlook mailboxes to Live Exchange Server. 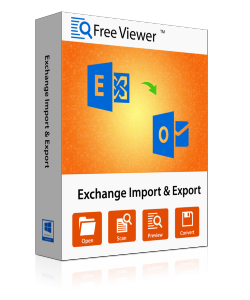 But FreeViewer PST to Exchange Migration tool made my work easy. With the help of this software, I was able to move hundreds of PST mailboxes in Exchange EDB mailboxes in a very less time." "The Graphical User Interface is very simple that even a non-technical person can also run and understand the functionalities of the software. Exchange Import is an effective tool for data migration from Outlook PST to Exchange Server EDB mailboxes. It saves a lot of time and efforts. Thanks FreeViewer, for such tool!" Exchange Export tool supports Outlook 2000, 2003, 2007, 2010(32/64 bit), 2013 (32/64 bit), 2016 (32/64 bit). The software supports MS Exchange 2016, 2013, 2010, 2007, 2003 (Source) versions. Exchange Migration Tool is compatible with Windows 2000, 2003, 2008, XP, Vista, or Windows 7/8/8.1, 2008/2012 (32-bit & 64-bit) versions. The Exchange Mailbox Migration tool extracts all mailboxes from Live Exchange server and transfers them in Outlook. It retrieves all type of mailboxes from the server like connected, disconnected, disabled, and enabled. Apart from this, the software exports items like emails, calendars, tasks, journals, contacts, etc., from Exchange to Outlook. 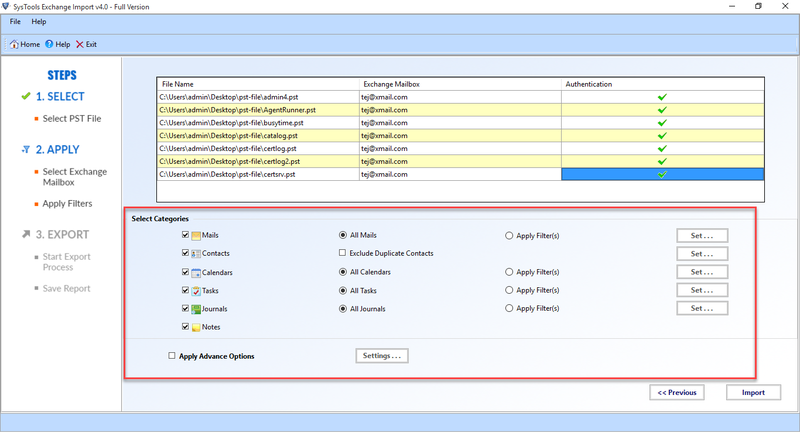 Exchange Mailbox Migration Software extracts Active Directory from Live Server environment. After clicking on Export button, the tool will automatically scan data from the server. The scanned mailboxes get loaded on preview window of the exporter. It makes an Active directory as well as Exchange server details visible. 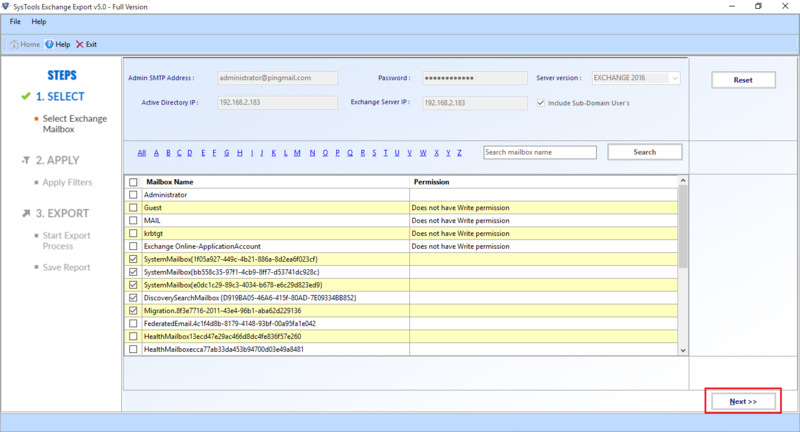 Exchange Mailbox Migration Application helps to view information of each mailbox. A person simply has to right-click on any of the desired mailboxes. A dialog box will appear in which descriptive information is shown like mails count, number of contacts, tasks, notes, etc. Remember that Administrative rights are needed for previewing all this data. Once the server Active directory gets listed on the preview wizard, users can check/uncheck the items accordingly. 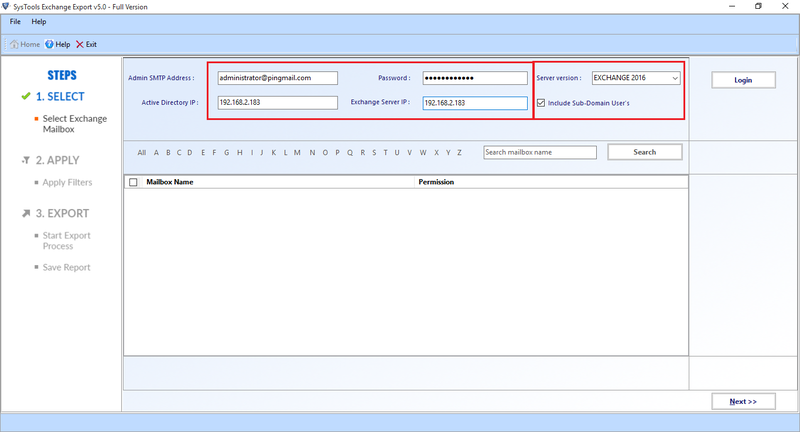 The Exchange mailbox migration tool provides date range filtering option to transfer emails of specific time duration. Apart from this, one is free to check only those mailboxes that they want to move in Outlook. The software facilitates its users with an advanced feature of deleting emails from the server mailbox. Once the Exchange server to Outlook exporting task gets finished, the software provides an option to permanently remove data from the server. This will help in freeing up the waste space of the server that was occupied by exported emails. If Exchange archive mailboxes data delete then, it will get moved in Dumpster. At the time of transferring, Exchange mailbox migration tool equips an additional option to move Dumpster emails in Outlook. In addition to this, the Exchange Mailbox Migration application also generates an export progress report having a record of the entire procedure. Demo Version of Exchange Mailbox Migration Software Only Export 50 Items from 5 Mailbox Folders to Outlook PST File Format. Explain the functioning of Exchange Export Tool? Step 1: Install & run Exchange to Outlook Migration Tool. Step 2: Click on Export button to export the EDB database. Step 3: Select and add the database. You will see a number of emails, contacts, journals, tasks, etc in a dialog box. Step 4: Apply filters for selective data migration and then, browse the destination location. Step 5: Click on Export button to proceed. The software will show all the details of the data items that are exported to Outlook. 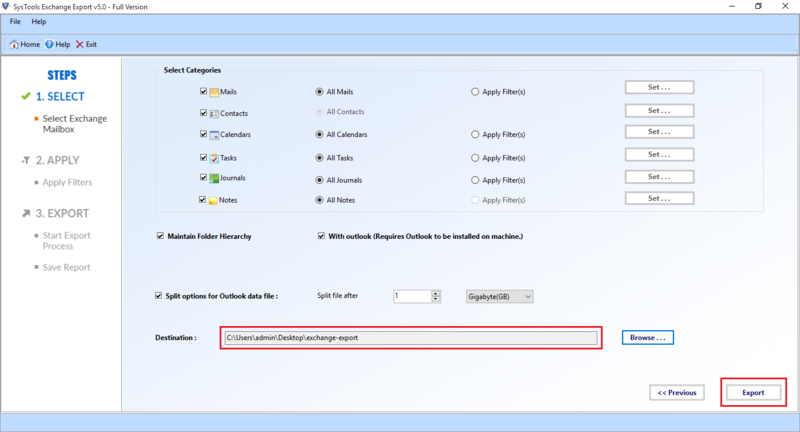 Step 6: After successful export process, you can access Exchange data in Outlook email application. Is it mandatory to have Microsoft Outlook pre-installed on the PC on which I have to migrate Exchange 2010 to Outlook 2016? Yes, installation and configuration of Outlook are compulsory on your PC prior to the migration. Will I require full administrator rights for exporting Microsoft Exchange mailbox to PST file? Yes, you have to acquire full admin rights to transfer data in Outlook with Exchange Mailbox Migration tool. It is so because our software deals with Live Exchange environment and extracts mailboxes directly from it. Can I transfer the public folder of Exchange 2013 to Outlook 2013 with this utility? Will I be able to utilize your exporter software on Windows 10 platform? Yes, of course, our Exchange Mailbox Migration tool is a Windows-based utility. This means that this product is compatible with all the available versions of Windows. I am having Outlook 2007 installed on my machine. Can I use this Outlook version with your software? Yes, no matter what version of MS Outlook you are having on your system. Our Exchange Mailbox Migration software works flawlessly with all available edition of it. "I have always been in a doubtful situation whenever I have to use third-party applications! But, conditions arise an urgent need to use them. 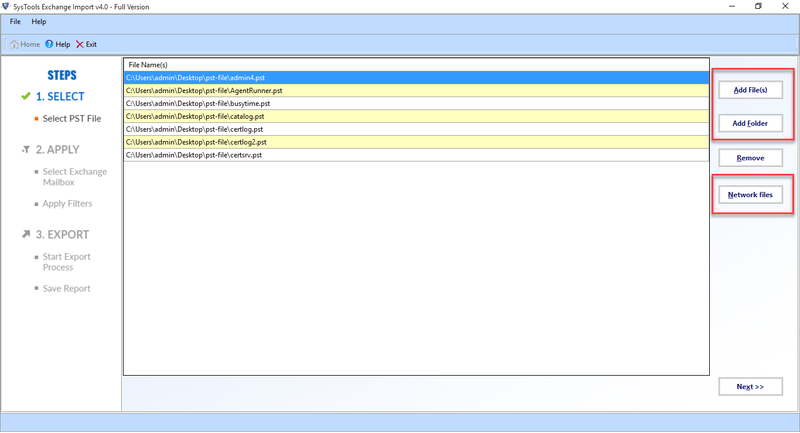 Well, I used this Exchange Mailbox Migration tool when I had to move 520 mailboxes of Exchange 2010 in Outlook 2013. Without any single problem, I was able to use this product and in a very easy way I carried out entire migration"
"The best this I liked about this Exchange Mailbox Migration software is its easy-to-use interface and the way it holds data integrity. I tried many applications but, none of them were worth for me. When I tried this FreeViewer product, it was the one that fulfilled all my needs. I was able to transfer bulk amount of mailboxes from Exchange to Outlook without compromising any data. Thank for providing such tool!"